The Mirabelle is a cherry plum, a distinct fruit, and not a hybrid of the two. One of the new heavy cropping hybrids, it produces masses of golden fruits. It tastes good fresh, but is also fabulous for cooking and baking with. 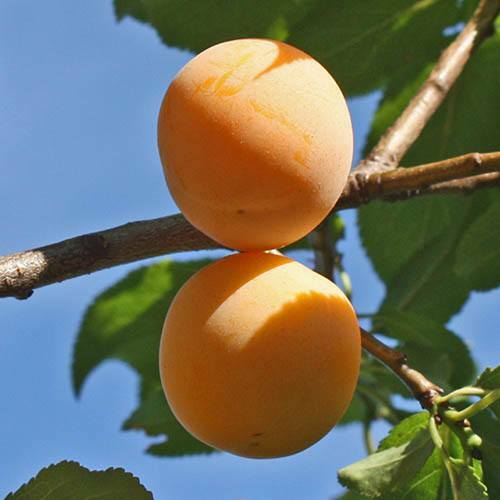 The Mirabelle is a cherry plum, a distinct fruit, and not a hybrid of the two. It produces masses of golden fruits, with a gorgeous yellow flesh, and a sweet, very juicy distinctive peach-like taste, and small stone. It tastes good fresh, but is also fabulous for cooking and baking with. Popular in France, Mirabelles make a great addition to the fruit garden. They do flower early, so can be prone to early frosts, so plant in a sheltered sunny spot if possible - but they fruit early too in high summer into September. Grown on 'Pixy' rootstock, they retain a more upright habit, making this ideal for smaller gardens - it will top out at 9-10ft in 10 years time, and make for easy picking. They are self-fertile too. Try one! The taste of Mirabelles is never forgotten.